An increasing number of “baby boomers” are lining up for major endurance events such as Coast to coast, Iron man and half marathons. Regular moderate exercise of up to an hour per day is proven to reduce the signs of ageing; improves mental health as well as helping to prevent obesity, diabetes , coronary heart disease and some forms of cancer. However, when undertaking major events which demand extra training, care must be taken to replenish the body’s nutrient stores. Every day we require sufficient energy to fund our daily activities at work or home plus body growth and repair. When extra exercise is undertaken energy and nutrient requirements increase. When these needs are not met fatigue, loss of mental functioning (mood and memory) and tissue breakdown can occur. On top of the added nutrient requirements senior athletes need to be aware of changes in bodily function which also impact on their dietary needs. Here are some of the functional changes senior athletes need to be aware of. Normally in sedentary people fat mass doubles between 20 and 50-60 years of age followed by a fall in body fat after 70 years of age. There is also a drop in muscle mass, muscle glycogen stores, aerobic capacity and a decrease in energy requirements. (2) These changes are less apparent in older endurance athletes who should be encouraged instead to maintain sufficient energy up to the age of 70 years to meet their higher needs for training and competition. Reduced energy density, slowing gastric emptying and raising satiety levels. A lowering of plasma cholesterol and providing Vitamin E, zinc and folic acid important for immunity and cancer prevention. A reduced incidence of bowel upsets particularly constipation and diverticular disease which are problems that often increase with age. Depending on individual factors, levels around 1.2-1.7g/kg of body weight per day may be required (15-20% energy intake). Fat is essential as a source of essential fatty acids, fat-soluble vitamins ( A, D, E and K) and as an energy source during low intensity or prolonged exercise at below 70% maximal aerobic power. Fat should provide 25-30% of energy needs. Older athletes do need to monitor their cholesterol level as changing liver function with age and the accumulation of abdominal (visceral fat) over time can compromise cardiovascular health and performance. Those with poor consumption of calcium rich foods such as milk and milk products. Athletes taking medications such as steroids or anticonvulsants. Athletes consuming high levels of sodium, phosphorus or caffeine. A decline in Vitamin D synthesis from sunlight can occur with ageing of the skin, along with the excessive use of sunscreen, excess clothing and depending on global latitude. With age there is a change in the cells lining the gut that are important for the secretion of gastric acid which in turn aids the absorption of Vitamins C and B12, folic acid, calcium, iron and zinc. Taking supplements of these nutrients will be less helpful than improving the intake of the whole foods in which they are found. With age there is a change in the way the body handles fluids. A reduction in saliva production can lead to a dry mouth, poor dental health and swallowing difficulties. As saliva provides enzymes that help the breakdown of carbohydrate and protein, gastric upset can occur. Changes in kidney function can alter fluid balance which in turn can also impact on an athlete’s ability to regulate their body temperature. 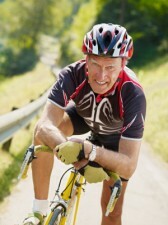 Exercise and ageing can both reduce appetite. While this can be beneficial for those who need to reduce their body weight, for those who already have a low body weight and high energy needs (e.g. marathon runners) care should be taken. Eating disorders are no longer confined to young people and can impact not only on an older athletes performance but also their longevity. Learn to alter your energy intake according to your activity levels at baseline, training and competition. In this way you can ensure nutrient adequacy, good recovery and great results long-term. If you would like to check the adequacy of your current diet and develop an eating plan that will maximise your performance and protect your long-term health, then contact us today. Next Can a high fat diet improve sports performance?